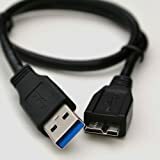 A replacement or additional USB 3.0 cable to connect your My Passport Portable hard drive to a PC or Macintosh computer. This entry was posted in Discount Computers and tagged 0.50cm, Cable, data, Drive, External, Hard, HDE1, Lead, Long, mone, Portable, Sony, Transfer by The Technology Report. Bookmark the permalink.